In the mean time allow me to share the recipes for roasting fresh pumpkin and the pudding recipe itself. I will be making this for my family for Thanksgiving, seriously we can never have too much pumpkin desserts. Medium size pumpkin (about 4 Lb), will yield 1.5 cups of puree. This will be enough for one recipe of the bread pudding, and the leftover can be refrigerated for up to three days. It can also be frozen in a tight plastic bag for up to six months. • Cut the pumpkin in half and discard the stem section and stringy pulp. (Save the seeds to dry and roast.) For a large pumpkin, cut into chunks. • Bake in a preheated 375 degrees F oven for about 1½ hours, or until tender. 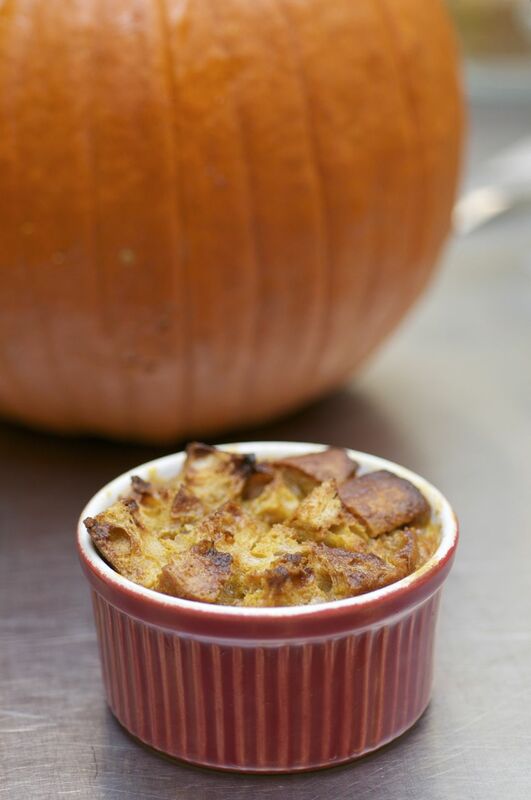 • Once the baked pumpkin has cooled, scoop out the flesh and puree or mash it. Some of the ingredients Ron used the day of the filming. Recipe will yield one 8” x 8” baking dish or (how many?) individual ramekins. Preheat oven to 350°F. Bake until set, 25 to 30 minutes.